We’d love your help. Let us know what’s wrong with this preview of Garnet's Queen by Chelsea O'Neal. Lives will forever be altered. Secrets are revealed. One person must decide whether to continue on the path of destruction or follow the Everlasting, while another learns she can be more War has come to the castle in Garnet City. With Daniah’s fate hanging in the balance, the close group of Zoku must come together and overpower the resistance, as well as protect the humans. 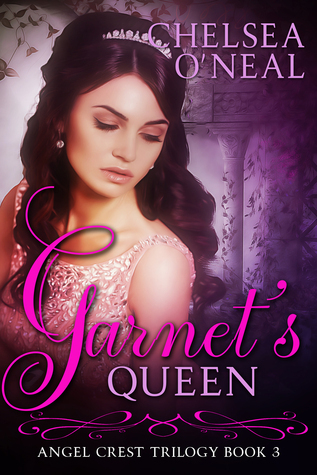 To ask other readers questions about Garnet's Queen, please sign up. This is one very action packed conclusion! Dani was captured, and the Delvo are preparing for the final battle. What they weren't expecting was for the Zoku to come together as they have and fight for their queen. Once again told from multiple perspectives you see the story played out through many eyes on both sides of the story which makes for an even more intense reading experience. Dani is in a horrible place at the beginning of the book but as the story continues we see as she works to get o This is one very action packed conclusion! Dani was captured, and the Delvo are preparing for the final battle. What they weren't expecting was for the Zoku to come together as they have and fight for their queen. Once again told from multiple perspectives you see the story played out through many eyes on both sides of the story which makes for an even more intense reading experience. Dani is in a horrible place at the beginning of the book but as the story continues we see as she works to get out and others worked to free her and we see the culmination in one ginormous battle. Definitely a satisfying end to the series, I think fans will be pleased. I really enjoyed seeing Chelsea's writing mature throughout this series, and can't wait to see what she comes up with next! This book was a little darker, and was so much fun to finish up this series. I enjoyed writing it, and I love how the characters lived it out in the story. I am excited for the conclusion of this trilogy. Enjoy! Actually Chelsea lives in the United States in Nebraska, where she was born and raised, with Chelsea O’Neal lives in her fantasy world where people can fly, vampires could be real, money is never an issue and the romantic meeting of your true love is a normal happening. When not relaxing in Chelsea-ville, she enjoys talking with animals who talk back and taking long walks with her prince charming. Actually Chelsea lives in the United States in Nebraska, where she was born and raised, with her black lab Daisey, who hasn’t spoken actual words to her but she is pretty sure Daisey understands her. She is yet to meet her prince charming, though she is quite sure he is out there. Chelsea enjoys working in a library as well as a cosmetologist. She is an avid reader and writing has always been her passion. Zoku's Hope is her second novel, and she is working on her next book now.